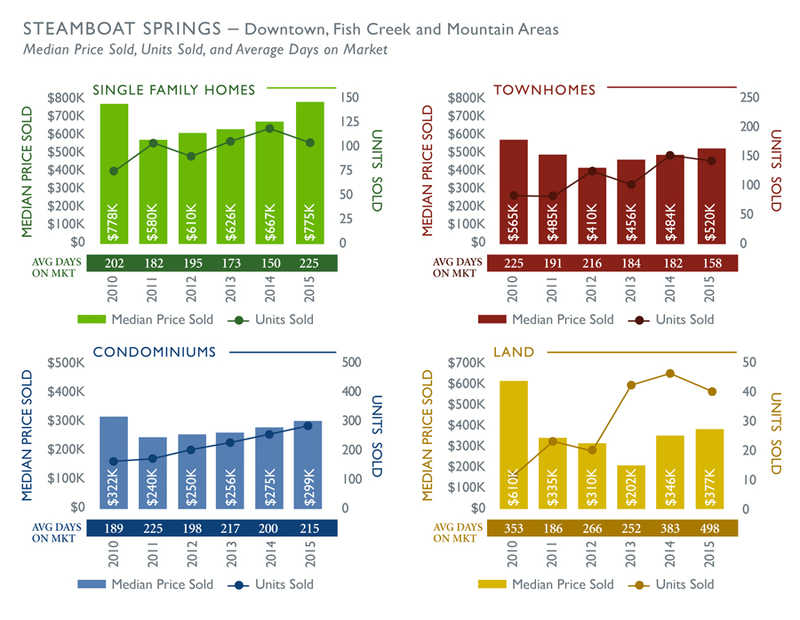 Since 2009, when the Steamboat Springs MLS reported its lowest # of transactions in over 20 years at 467, and subsequent reduction in property values, where in 2012 the average purchase price dropped to $440K, the market has steadily and systematically climbed out of the doldrums. In 2015, the market posted the fifth best year ever in total dollar volume at $530M, and # of transactions with 1,074, for an avg price of $493,033. With a 5% increase in transactions from 2014 to 2015, one would expect that an increase in dollar volume would follow, but it actually remained relatively flat. This is largely due to more pronounced activity in properties under $500K, and the fact that land sales, with a median price of only $179K, represented a more significant number of the transactions. On the residential side, there were 103 single family home sales within Steamboat city limits (-13% from 2014), but median price increased $108K to $775K (+16%). Single family home sales increased 15% outside of Steamboat, possibly because of more affordable options in neighboring communities. Condo sales were the strongest since 2007 with 284 sales (+13%) at a median price of $298,500 (+9%). Listings in 2015 dropped to 1573; the lowest level the market has seen since 2007, and this lack of supply will likely increase pricing pressure. Further, with the excitement of the revitalization efforts at the mountain and downtown, it is reasonable to expect the real estate market in Ski Town, USA, to continue on its upward path.